This year, British Astronaut Tim Peake will be spending his Christmas aboard the International Space Station (ISS). So how will he go about having his traditional dinner with all the trimmings? He might need the help of some velcro and some scissors, as Kat Arney reports. Kat - Many people around the world will be joining together with family and friends at this time of year And a big part of it is sitting down together and tucking into a tasty festive feast. But this isn't just restricted to the earth-bound among us. British astronaut Commander Tim Peake and his colleagues up on the International Space Station will be celebrating together too. But what will it be like? For a start, because it's an international enterprise not everyone on the ISS actually celebrates Christmas, which is a nominally Christian festival. Nonetheless, December the 25th has been adopted as a holiday in space, just as it is in many countries back here on earth. So that means a relaxing day off for the astronauts, with only essential or emergency tasks to attend to. Based on the food packages he knows have been sent up with him, Tim has said that he's looking forward to starting his Christmas day with a bacon sandwich. And he's also said that there will definitely be Christmas pudding, as apparently one went up on a previous mission. But what about the main meal itself? Rather than sharpening up their carving knives and wrestling a turkey into the oven like many of us here in the UK will be doing on Christmas day, Tim and his colleagues will be cooking in a very different way. For a start, they have to deal with a problem we don-t have in our terrestrial kitchens - zero gravity. Everything needs to be pinned down, either with duct tape or Velcro, to make sure it doesn't go floating off round the place and cause problems. Then there's the food itself. It mostly comes in sealed bags and pouches that are heated up in a food warmer - there are no ovens or gas burners up on the space station, for obvious safety reasons. It also means that the most important kitchen utensil isn't a knife or a garlic press - it's a pair of scissors. Whatever meal they're eating, all the food is pretty sticky and solid, to cut down on the risk of rogue crumbs, liquid or peas escaping and causing havoc with the air conditioning ducts. Living in zero gravity also means that trying to put food on plates is a waste of time. Astronauts prefer to wrap their meals in tortillas, or just eat food straight out of the pouch. In terms of Christmas dinner itself, the choice of food is down to each crew member. Some may opt for a vague approximation of the traditional festive feast - sliced turkey, reconstituted potatoes and processed vegetables. But as the airline industry knows well, up at altitude food can taste more bland than usual, and even more on the ISS. So Tim and his colleagues might opt for something a little more tasty. One more thing - if you're anything like my family, it just wouldn't be Christmas without a boozy tipple or two. Or three. Or five. But sadly for the occupants of the ISS, alcohol isn't allowed due to risk of it interfering with the space station's water filtration system - despite rumours that the Russians may have smuggled up a secret stash of vodka. And in case you were wondering, yes they do have a box of Christmas decorations up on the International Space Station - and just as it is for many of us here on terra firma, apparently it can be a bit of a challenge finding them when the festive season starts. 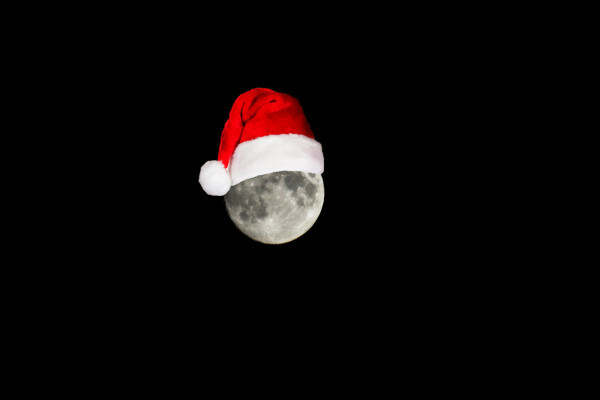 Finally, as we come to the end of the year, I'd like to wish for joy and peace on earth - and in space - for all of us. I'll see you in 2016 for more science fun. Previous Good at board games: good at life?